American League wild-card game: How bad was the Kansas City Royals’ bunt-all-the-time strategy? 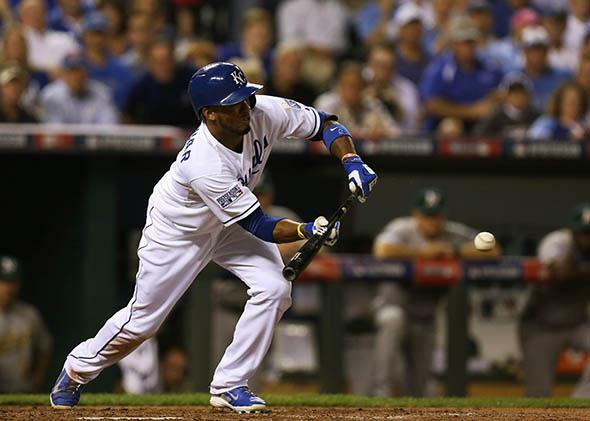 Alcides Escobar of the Kansas City Royals bunting during the American League wild-card game on Sept. 30, 2014. Tuesday night’s American League wild-card game between the Kansas City Royals and the Oakland Athletics—a 9–8, 12-inning win for Kansas City—was the most exciting game of the 2014 baseball season. Also, there were a lot of bunts—seven overall, five of those by the Royals. That total was tied for the most bunt attempts in a single game this year, and for good reason: Bunting is generally not a winning strategy. So, despite the Royals’ eventual walk-off win, did their bunting do more harm than good? Would they have had a better chance of winning if they’d swung away? Baseball statisticians often use a metric called Win Probability Added to measure a play’s success. We can use an example from Tuesday’s game to explain how it works. In the top of the sixth inning with Oakland trailing 3–2, the A’s Josh Donaldson walked to put two men on with no outs. Based on historical game outcomes, at that point Oakland had a 49 percent chance of winning the game. The next man up, Brandon Moss, hit a three-run homer to give Oakland the lead, at which point the A’s had a 79 percent chance of winning. The WPA of Moss’ home run, then, was 0.3—the difference between Oakland’s win probability after the homer (0.79) and before Moss came to the plate (0.49). That means that, for Oakland, the outcome of that at bat was 30 percent better than the average outcome of such plate appearances across baseball history. You can compute WPA for any event in a baseball game. For bunts in particular, which are typically called by the manager, WPA is a reasonable measure of tactical acumen. So, how did the Royals’ Ned Yost do on Tuesday night? Using the WPA metric provided by Baseball Reference.com, we can see that the combined WPA of the Royals’ five bunts was -0.08—a net negative, but not anywhere close to as important as Moss’ home run, for instance. Bunt No. 3: In the bottom of the ninth with nobody out and the Royals losing by one, Escobar again sacrificed a runner to second. This time, the Royals’ win probability dropped from 33 to 28 percent, making this the most costly bunt of the game. However, pinch runner Jarrod Dyson immediately stole third and scored the tying run on a sacrifice play, sending the game to extra innings. But maybe the Royals could’ve won in regulation if they hadn’t given away an out on a sacrifice. Bunt No. 4: In the bottom of the 10th, again with nobody out and a man on first, Kansas City’s Christian Colon sacrificed to move the winning run to second. This dropped the Royals chances of winning by 0.01, from 71 percent to 70 percent. Since the Royals only needed one run to win, they weren’t hurt all that much by reducing the chances of a big inning. Bunt No. 5: An Oakland bunt! In the top of the 11th with one out, Sam Fuld tries to bunt for a single but is thrown out. This cuts the Athletics’ win probability by 0.04, from 44 percent to 40 percent. Bunt No. 6: For the third inning in a row, the Royals sacrifice a runner to second with no outs. This is the exact same scenario as the previous bunt, moving Kansas City’s win probability from 71 percent to 70 percent. But as FanGraphs’ Dave Cameron points out, this doesn’t take into account that the bunter was the speedy Jarrod Dyson, who has reached base on 40 percent of his career bunts. Though Dyson was thrown out at first in this instance, and the Royals didn’t score in the inning, the decision to bunt here is totally defensible. Bunt No. 7: Another Oakland sacrifice. In the top of the 12th, Jed Lowrie makes the first out of the inning while moving Josh Reddick to second. This cost the Athletics 0.02 in win probability, though the A’s would go on to take the lead. They’d relinquish it in the bottom of the 12th, the first time since the eighth inning that the Royals didn’t bunt. That’s a lot of bunts. To compare this bunt-a-palooza to the rest of the 2014 season, I scraped Baseball Reference’s play-by-play records for 2014—2,430 games in all—and found every time that the word bunt came up in play-by-play logs. This included sacrifice bunts, bunts for singles, and foul bunts that turned into strikeouts. The grand total: 2,917, or 1.2 per game. That means that the American League wild card had nearly six times the bunting excitement as the typical major-league game. According to the 2014 data bunts are, on the whole, overused. While there were plenty of bunts that resulted in positive win probability, the average bunt cost its team 0.0042 in win probability, or 0.4 percent. The best argument against bunts isn’t that they’re a moderately poor strategy overall. It’s that even when they work perfectly they don’t make sense. In Tuesday’s game, for example, Escobar’s bunt in the bottom of the third advanced the Royals’ runner to second, just as manager Ned Yost intended. It still cost Kansas City 2 percent in win probability. When something goes exactly according to plan and it’s still a losing strategy, then you might want to rethink that strategy. It’s important to remember that these figures are based on historical averages of teams in the same scenarios. With thousands of data points arguing against the bunt, it’s hard for anyone to make the argument that the bunt is an underutilized strategy. That goes double for the Royals considering that they’re so good at stealing bases. In Tuesday’s game, Kansas City went 7 for 8 on steals, increasing their win probability by 21 percent. That more than outweighed the win probability the Royals lost by bunting. Go figure: It makes a lot more sense to get an extra base without giving the other team a free out.